The real estate world has a peculiar resemblance to the fashion world. It is riddled with trends which come and go. As a result, buyers from both worlds are led by emotions. Increasing your properties value then attracting and selling to buyers is a matter of perception, rather than reality. A clothes store dresses and displays dummies to create a perception of what their customers would look like if they wore the same clothes. In reality, most customers don’t always look like the dummies, after making a purchase, but nonetheless, this kind of staging captures their emotions and convinces them to buy. Similarly, if you want to sell your house, you have to give it a facelift that gives buyers the right perception. A lovely outdoor landscape is often associated with class and status. Class and status, on the other hand, are associated with wealth. Moreover, statistics reveal that nature, especially trees and flowers have a positive effect on people. You need to leverage on this statistic by adding greenery to your outdoors. Planting trees, shrubs, creepers and flowers is an affordable process which takes a few hours, but yields long term benefits. Also ensure your lawn is well manicured and if you have hedges, trim them to achieve a neat look. By maintaining a leafy outdoor area, you’ll not only increase the value of your property but also ensure that the first impression is a positive one. Buyers will definitely be impressed the minute they walk onto your property. A clean and tidy outdoor area speaks volumes about a property owner. Cleanliness plays a major role in creating a positive first impression as well. Any form of dirt be it dust on the windows or junk piled up in the corner of the yard, will be easily noticeable. A large oil stain in your driveway will deter buyers at first glance as they will believe that the rest of the home will be uncared for too. Fixing this is cheap and easy, so well worth the effort. Sweep up dead leaves from your pathways, patios and backyard, if any. Also ensure that your garden beds are neat and tidy and not filled with weeds. A splash of colour in the garden and on your patios will help to attract more buyers and leave a better first impression. Use the right kind of detergent on your windows, walls and floors to achieve the best outcome. If you’re dealing with years of dust, mud, weeds and oil stains, consider using a pressure jet washer. The high-pressure water will remove most stains and dirt quickly, including weeds on pathways around your home. You can either purchase or hire one, depending on your budget and future needs. Buyers will associate dirt and a mess with negligence, which can harm the value of your property not increase your properties value. You’d be surprised by how much change a little paint can bring to a property. If your property is very old, a thorough cleaning may not restore its original look. Painting however, will bring life to any dull property. The good news is that you can paint the house all by yourself without hiring professional help. While choosing the paints, go for neutral colours, which are appealing to the larger majority. Paint both the interiors and exteriors and remember to research on what’s trending. If customers are attracted to accent walls and coloured accent doors, then consider this option to give your home a competitive edge. Lighting is one of the most dynamic elements of a home that have evolved dramatically over the years. From majestic chandeliers to focused lighting and pendant skylights; just like paint, lighting can easily bring life and brightness to a dull home. To ensure your property is on par with modern standards, install modern fixtures in strategic areas, such as the bedrooms and the kitchen. Ensure all the rooms are well lit since brighter homes always sell faster than dull and dark homes. Even though artificial lighting needs to be adequate and modern, natural lighting should always come first. Most buyers always look out the positioning of windows and their ability to bring in natural light. Therefore, keep the curtains and windows open during open days and replace dark, heavy blinders with simple modern ones. Install modern skylights in areas that lack adequate natural lighting. These make a huge difference, increase your properties value and have proven to be very popular with modern home buyers. The bathroom is one of the most sensitive areas of a house. It needs to be safe, fresh and modern. It’s surprising how minor details easily put off potential buyers, such as old tiles or dripping taps. Adding value to this part of the house requires more creativity than financial input. Start by cleaning every inch of the bathroom and replacing old tiles. Ensure the grout is sparkling clean, as it can harbour disease-causing germs. You may then replace the seemingly small and irrelevant features such as taps, shower heads, door knobs, and shower curtains. Also, ensure you have plenty of storage and that your sliding doors are as modern as possible. In a nutshell, pay attention to detail when it comes to renovating your bathroom because something as minor as wrong tile colour can affect a buyer’s perception thus downgrading your property’s value instead of increasing your properties values. The kitchen is the heart of a home. A good exterior will impress potential buyers but a modern kitchen will close the deal. You need to ensure your kitchen is as modern as possible. This can be achieved without digging deep into your pockets. First, ensure the lighting is both modern and adequate. Smart skylights or pendant chandeliers add an irresistible shimmer to your countertops. Second, ensure all the inbuilt appliances are not older than five years to eight years. In addition, settle for appliances with stainless steel materials for easy cleaning. Third, freshen up the paint to give your kitchen a new look. The kitchen is a very well used area in most homes – cooking, food preparation and general use of the area can take its toll on the walls, countertops and appliances. Ensure it gets a proper scrub and a fresh coat of paint at the very least. Updating cabinetry by changing handles and painting the cabinets is another great way to give it a modern touch without overspending. Adding small touches like indoor plants will also make the room feel a lot fresher. Overall, put yourself in the shoes of a potential buyer and go through the entire house. While at it, make sure the entire property is spotlessly clean and that nothing in it is too old unless it has a sentimental value. Ensure all doors open properly without creaking sounds. The slide doors should also glide smoothly and the floors should be safe and clean. Also replace door handles, bulbs and sectional rugs to give the place a new refreshed look. If the financial implications are too much, consider working in phases or tackling one room at a time. 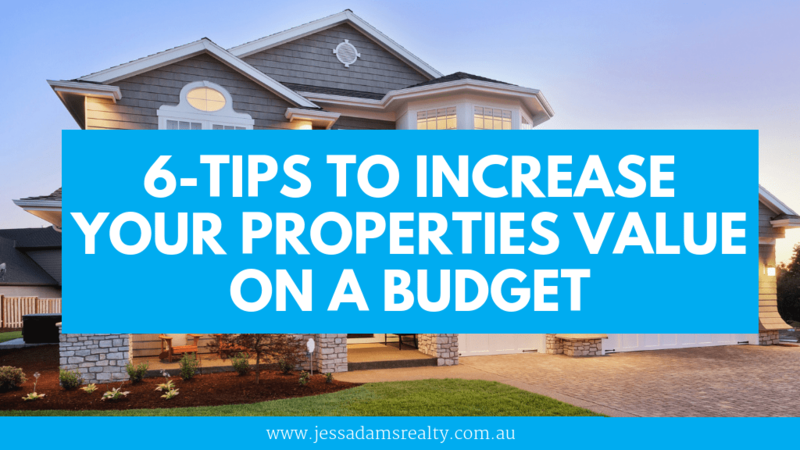 In a nutshell, increasing your property’s value on a budget requires dedication, research and planning. Where necessary, consult the experts to gain an understanding of what modern buyers are looking for. While undertaking this process, motivate yourself by thinking about the monetary returns your efforts will attract. Lastly, calculate your expenditure and ensure everything you spend on is bound to impact buyers’ perceptions and increase your property’s value monetarily.